Part of our Simple Life is to consume less, buy local, choose products carefully and recycle or re-use what disposable products we do buy. Its easy to find a second use for lots of products that are designed to be 'single use'. I keep all my toilet rolls to use in my greenhouse as seed savers. The toilet rolls can be planted directly into the garden, as they'll break down. I'm lucky enough to live near a Co-Op and can buy a lot of my food in bulk, using re-usable containers- Jars, bottles and paper bags. I have lots of jars at home. Lots. I buy 1L jars of coconut oil and keep the jar. These are the best jars for storing grains, flour, rice, cereals, nuts, etc in. I use smaller jars for homemade goodies- pestos, jams, marmalades, creams, etc. I also use jars as take-away containers. Every morning, during winter, I cook porridge on the stove, put it in a jar with sultanas, put milk in another jar and take them to work/ kindy. 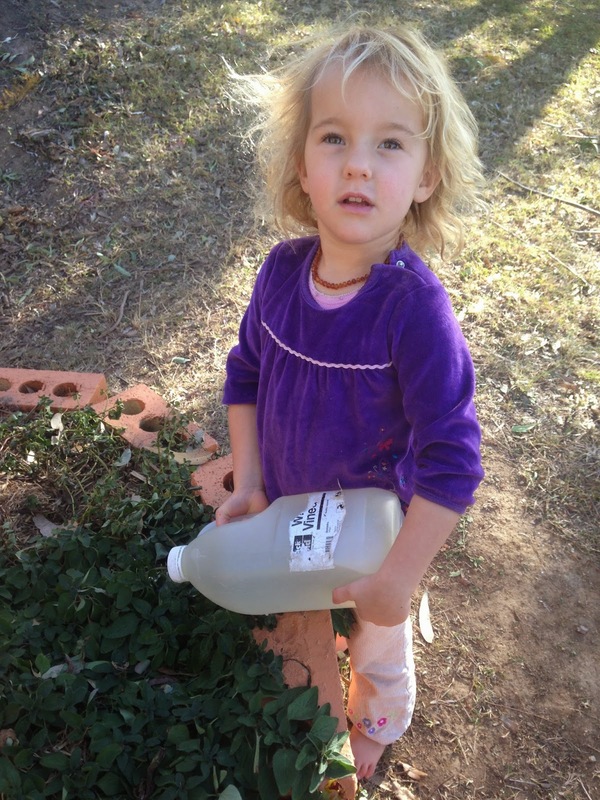 When we get to kindy, I pour the porridge out of the jar and into a bowl for Gigi to eat and add the milk. When I get to work, I eat my porridge out of the jar. My colleagues think I'm pretty weird, but I can live with that. We re-use our milk bottles by cutting the tops off and turning them into storage containers and organisers. The soaps in my bathroom cupboard are stored in a milk cartoon, I have toiletries in another, cleaning cloths in another. In the toy-space, they are used to store Gigis pencils, small toys, feather, coloured rocks, etc. Other milk bottles have had their bottoms cut off and I use them as scoops for goat/chicken feed. 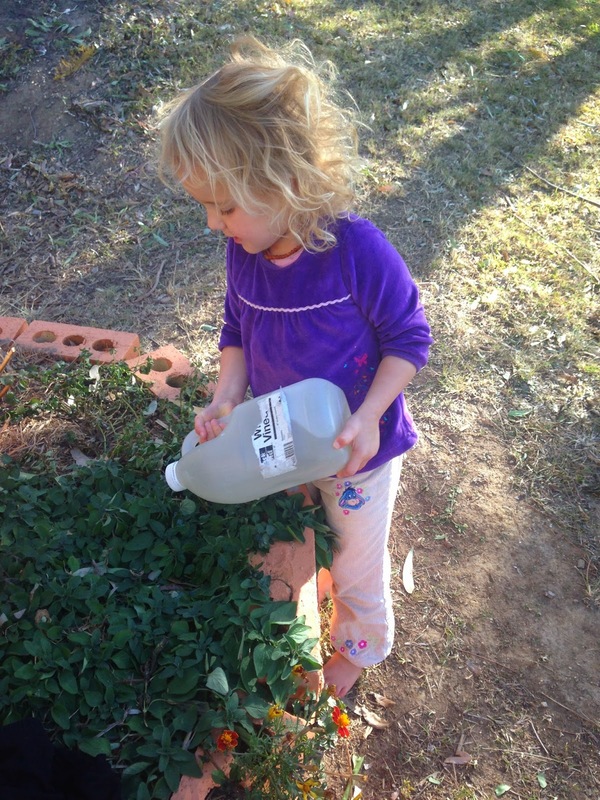 Other bottles have holes punched in the lid and are used as small and light watering cans for our green house and herb spiral. Old clothes that can not be donated are also re-used. Some I cut into squares to use as disposable cleaning cloths. These can then be composted. 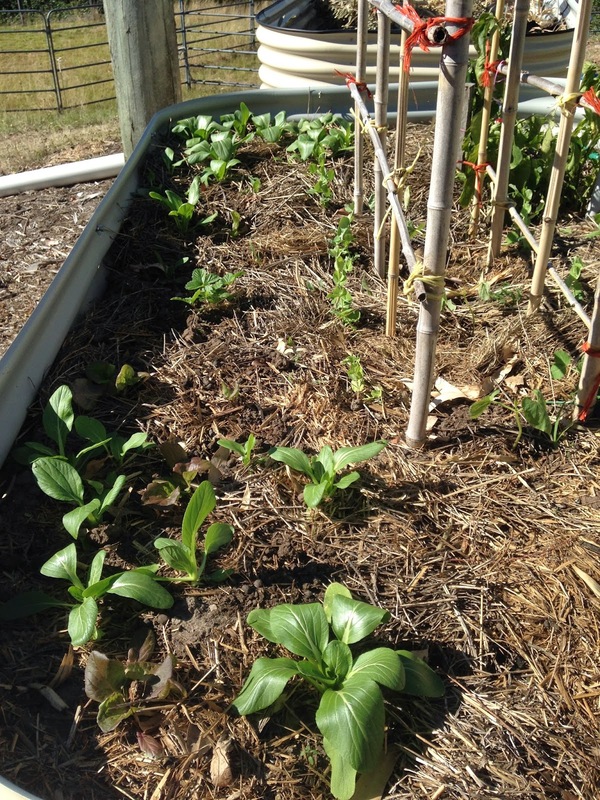 Other items are cut into strips to be used in the veggie garden for staking plants. At the start of each winter, I buy three pairs of black cotton tights. I wear them every day and by winters end, they are full of holes. I usually repair the holey ones and wear around the house, but eventually the cotton 'rots'. 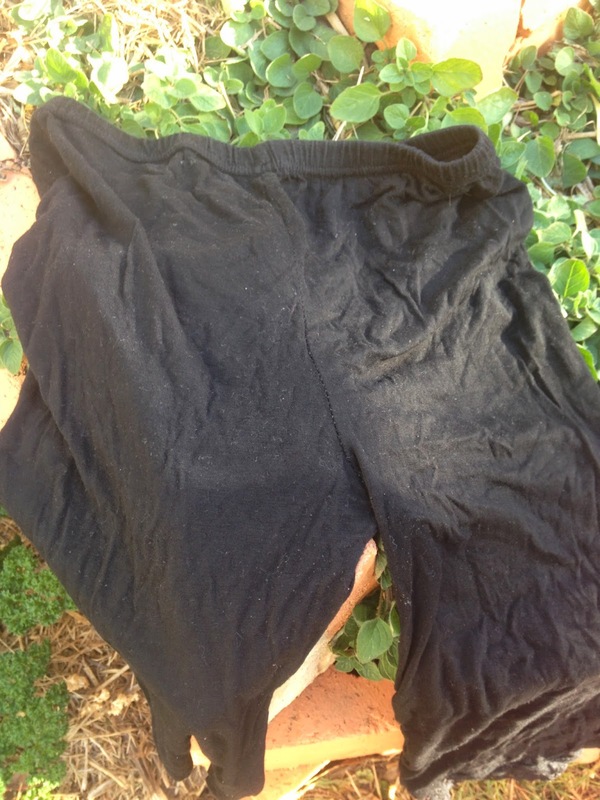 This pair of tights is a few years old. They were thin, rotten and full of holes. The perfect candidate for staking some of my plants. 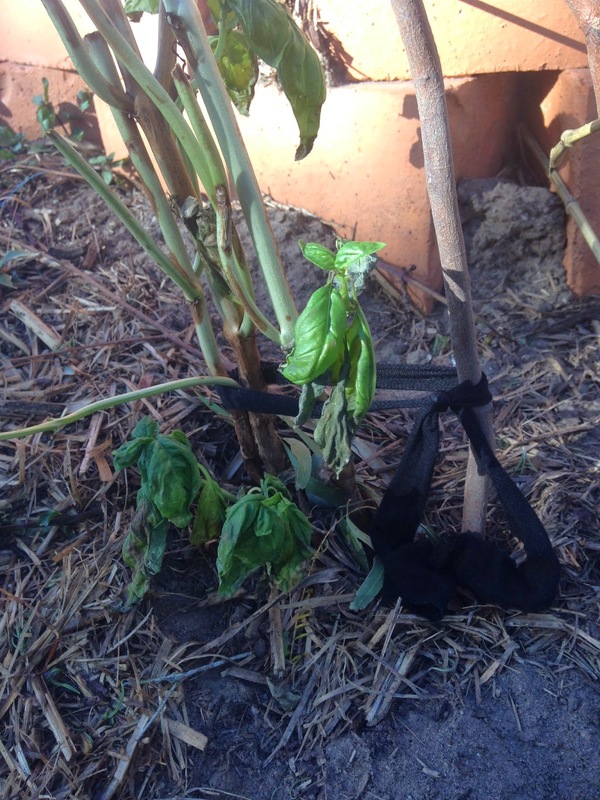 I just cut the cloth into strips and tie the plants to stakes. Most of my stakes are sticks found in the garden. 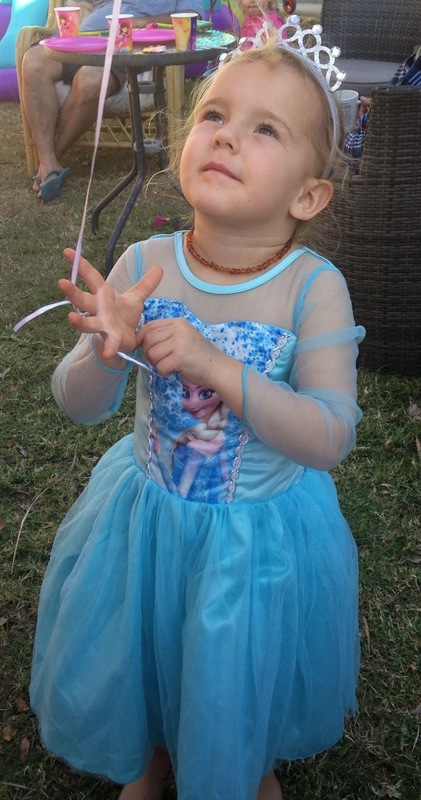 Today, July 16th is Gigi's 3rd Birthday. 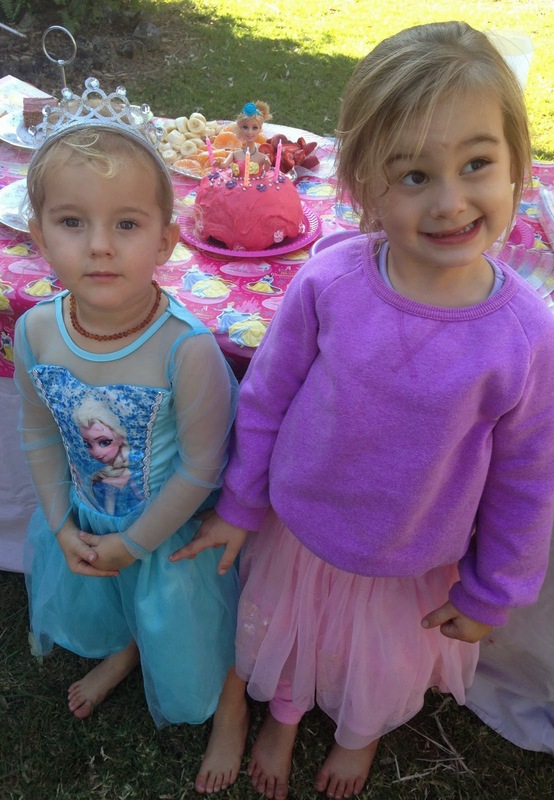 We celebrated on the weekend by having a small party with family. Gigi's Nana; Poppa; Uncle Benny; Cousins Lily and Asha; Old Pop; and Gran-Nan all came for afternoon tea and cake. 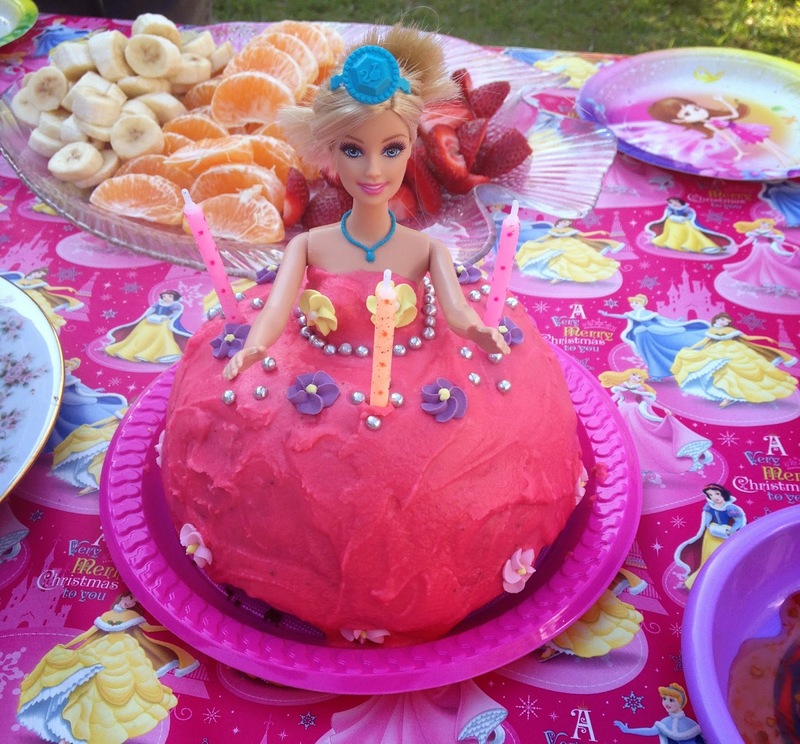 Gigi's Nana (my mum) made a princess cake. 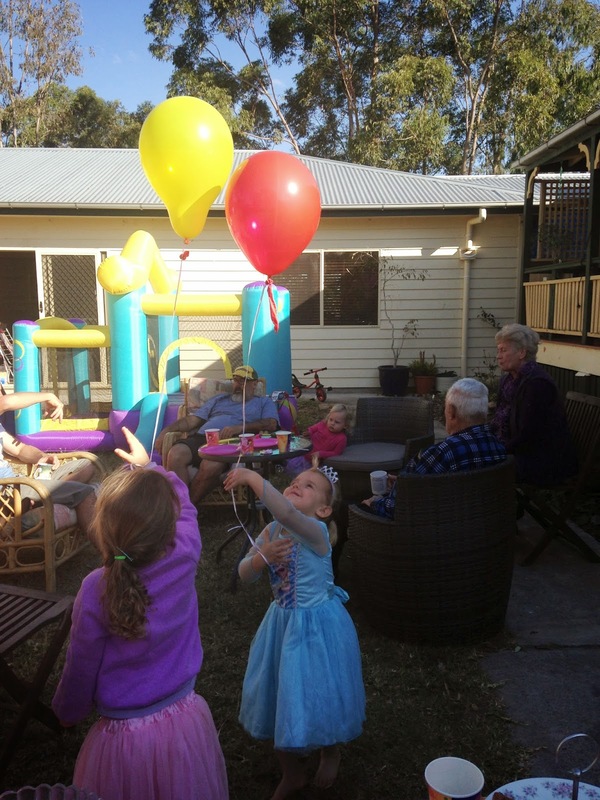 The girls ran around all afternoon, playing with balloons, chasing chickens and jumping on the trampoline. 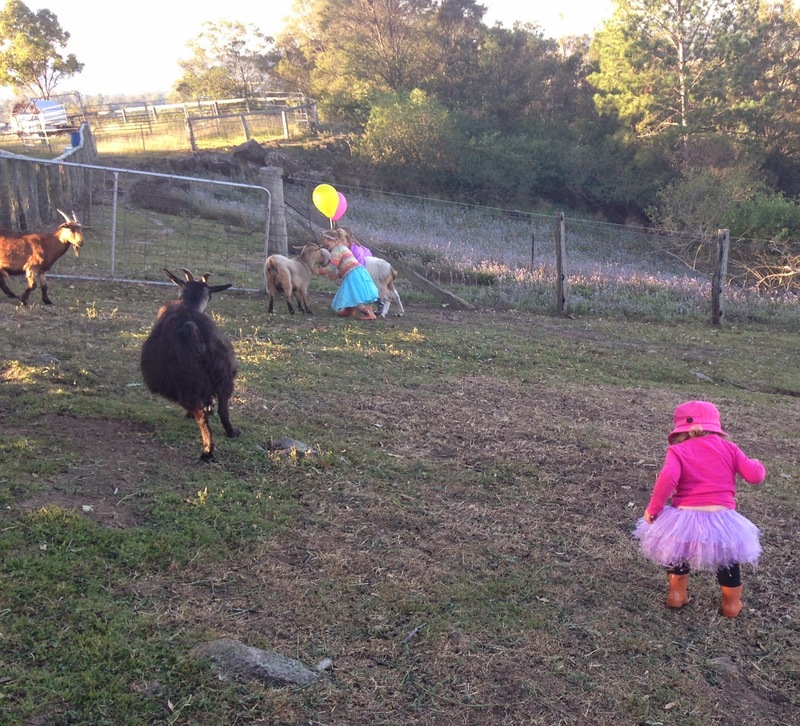 Later, we went down to the goat paddock, so they could pat the goats and try to catch the babies. It was a low-key affair- my mum and I prepared all the food ourselves, there were no 'party games' or 'goody bags'. Just kids running wild and adults catching up for a chat. 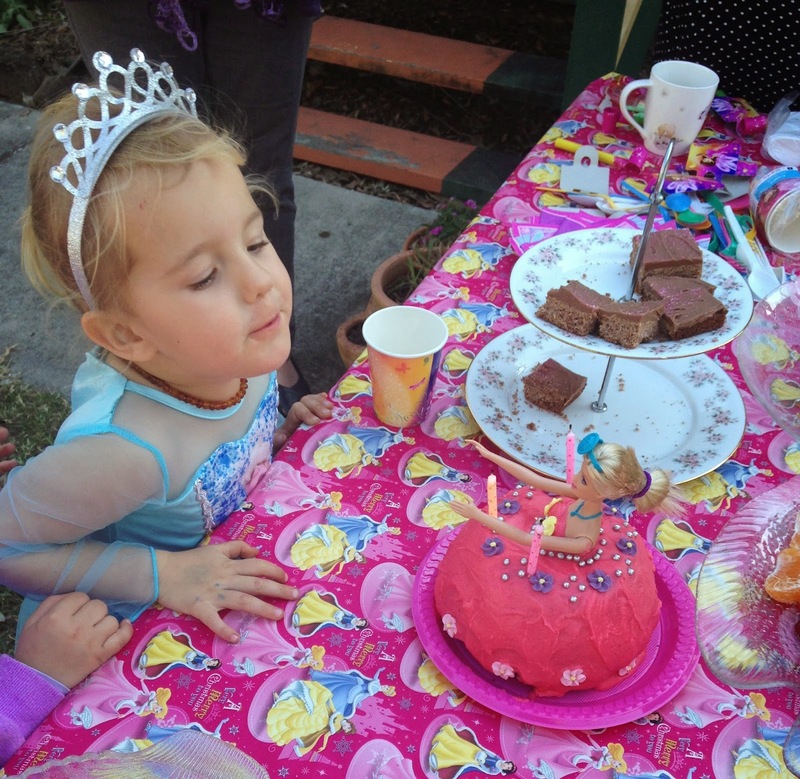 Today is Gigi's 3rd Birthday (16th July). For her birthday, I wanted to give her a dollhouse, as shes been showing interest in the ones at the shop. 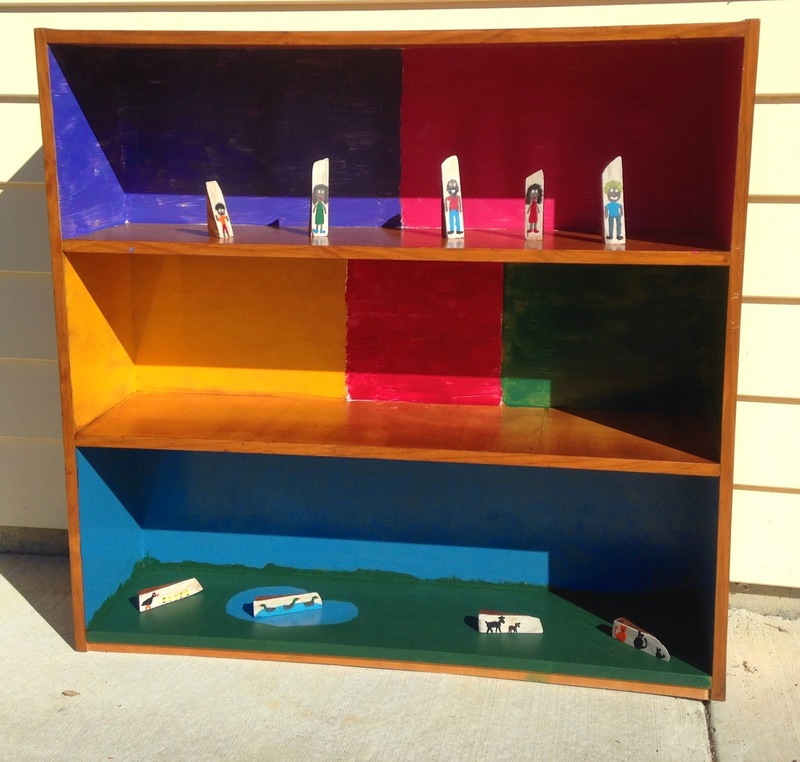 I spent a few weeks scouting Op Shops and Gumtree for a cheap, solid timber book shelf to convert to a dollhouse. Finally, I found one for $20 on Gumtree. I sanded down the bookshelf, painted it white, then painted the shelves with poster paint. The bottom shelf is the 'farm' section of the house, with green grass, blue skies and a pond. The middle and top shelves are the 'house' part of the dollhouse. The middle shelf is painted in three different coulours to represent kitchen, bathroom and living room; whilst the top shelf is two different colours to represent two bedrooms. Obviously I didn't get it finished before her birthday. I still have to put in some bits of wood for actual room dividers and I'd also like to paint on some trees on the bottom level and windows and doors on the top levels. 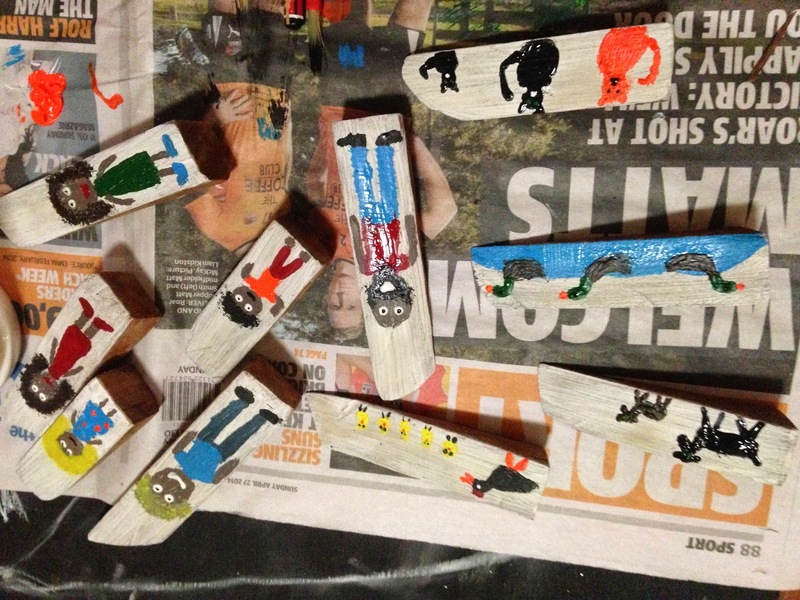 For dolls in the dollhouse, I used some wood offcuts, sanded them back and painted them with people and animals. I'm not a great artist, but luckily Gigi has enough imagination to recognise the chickens, ducks, goats and cats that I painted for the farm level. I also painted 'dolls', modeled on our family. There is 'Nana', Gigi','Mumma', 'Poppa', and 'Daddy'. Gigi loves the dollhouse, she thinks the 'Gigi' doll is hilarious and she tells a little story as she plays with them. As time goes on I will make more people, animals and some furniture for the dollhouse, as well as finish it, according to the plan in my head. As I said in a previous post, winter has hit with a vengeance. My cottage is located within a floodplain, close to a reasonable sized river. 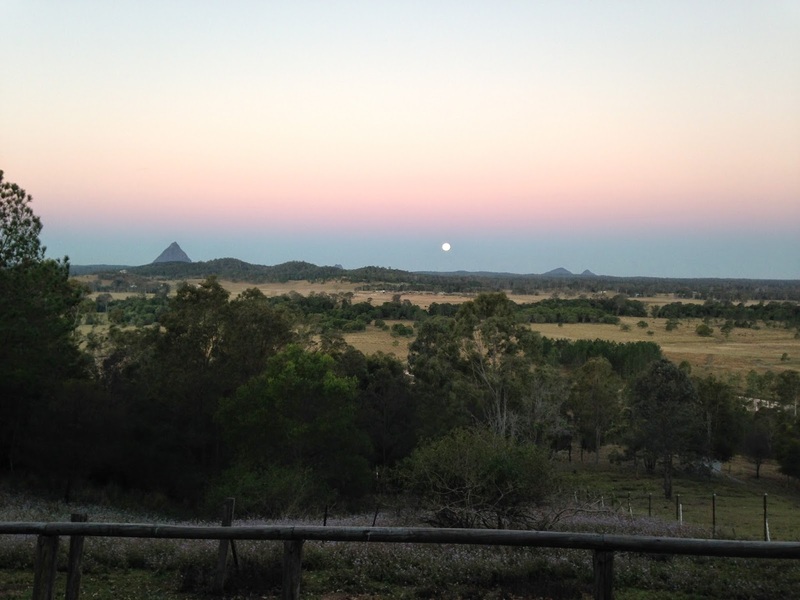 Therefore it has been getting all the frosts that have hit South-East Queensland this winter. I have no experience with frosts. The last few winters have been quite mild and I've always lived at higher altitudes, where there is no frost. 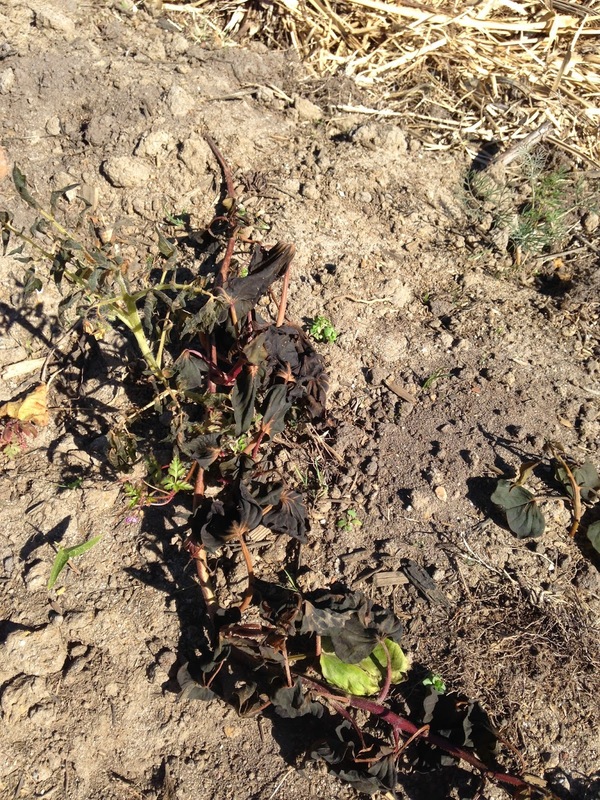 It was quite a shock to have a look in the garden at my cottage and find most of my food plants killed by frost. The leaves have blackened and the plants are dead. I'm so disappointed. I had no idea this would happen. My sweet potatoes, cherry tomatoes, herbs, and food forest small trees are all dead. I'll replant everything in Spring and hopefully it'll get enough growth in three seasons to survive the winter frosts next year. I've left the plants in the ground, in the vain hope that maybe some aren't dead and will return to life in spring. On a positive note, my veggie gardens at my parents property are going great. 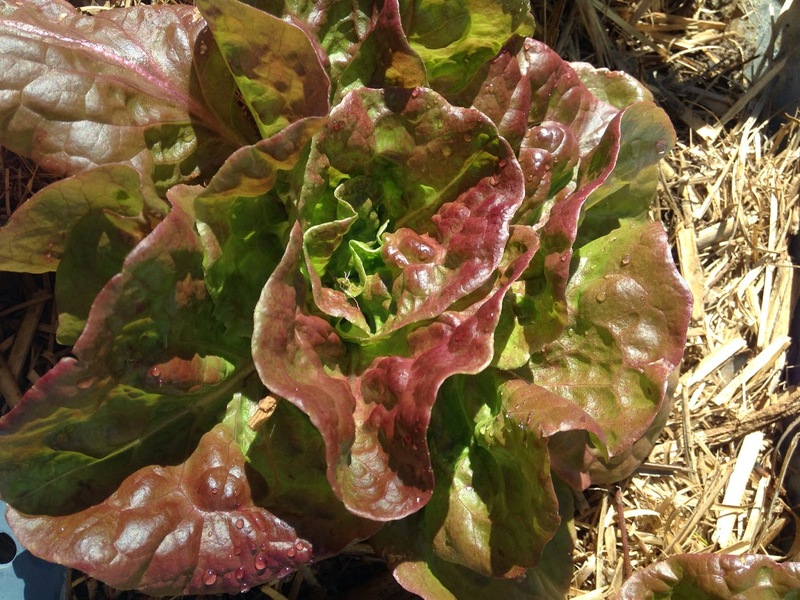 The lettuce seeds I planted in my raised garden bed 'to see if they would grow' are now delicious lettuces. I have been harvesting a few leaves everyday to have on sandwiches. 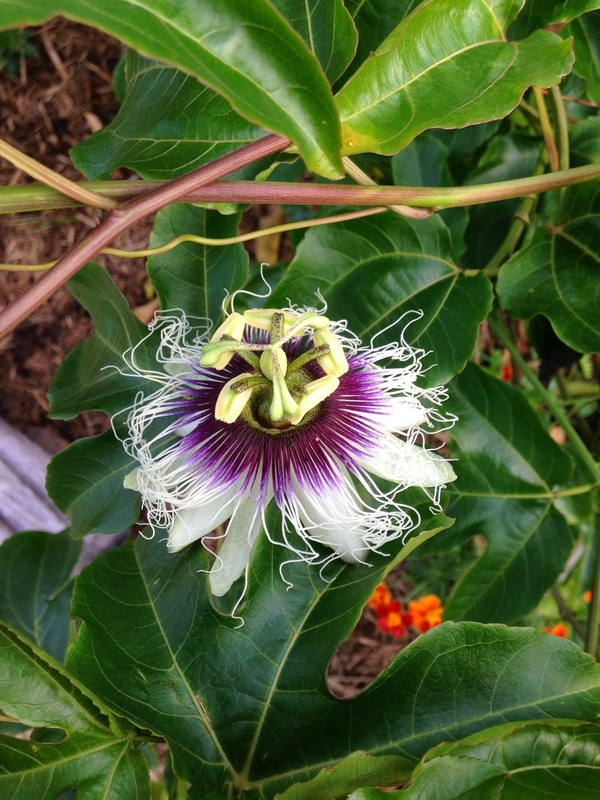 I plan to let one or two of these go to seed and save the seeds for next year. 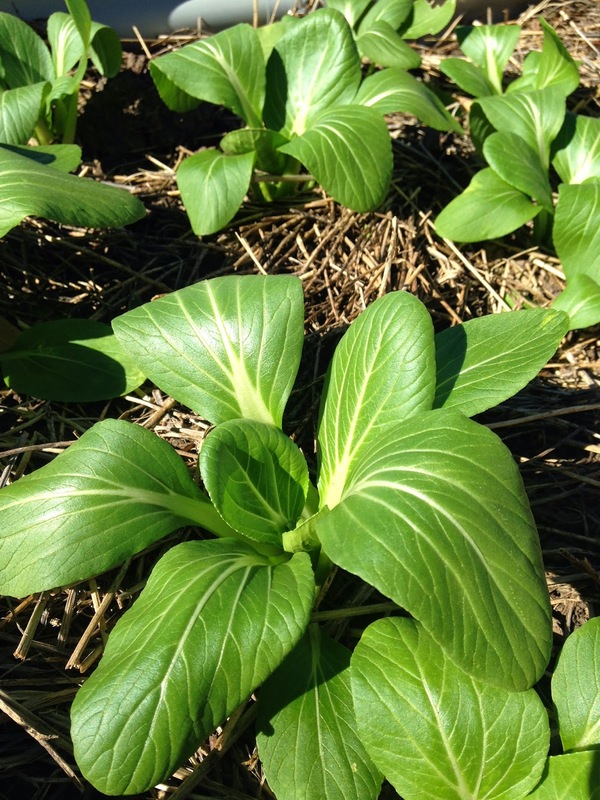 The Bok Choy seeds I planted have grow into little plants, that will be ready for harvesting in a few weeks. I sowed the seeds into seedling trays and grew the seedlings in my greenhouse, before transplanting them into my raised garden bed. The seeds were ones I saved from last year and once again, I plan to allow one or two go to seed so I have seeds for next year. 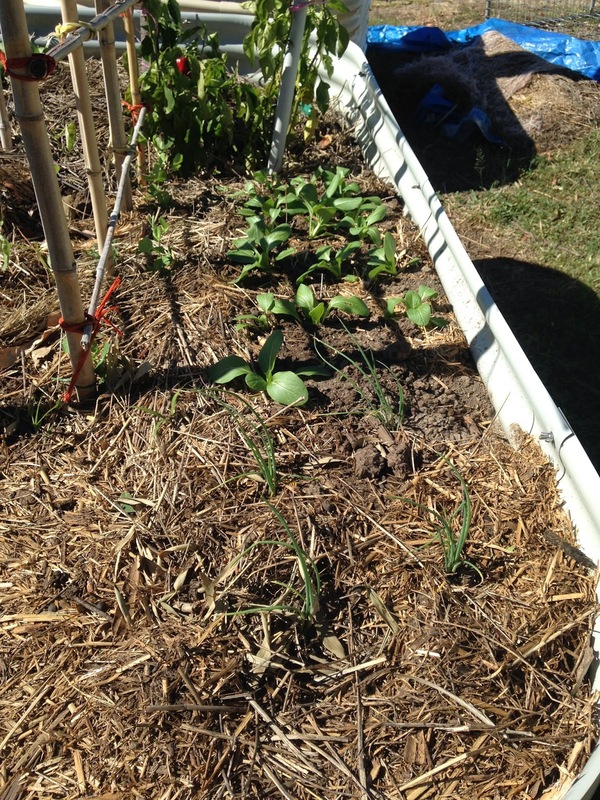 The raised garden bed also has beans, snow peas, lettuce and chives growing in it. 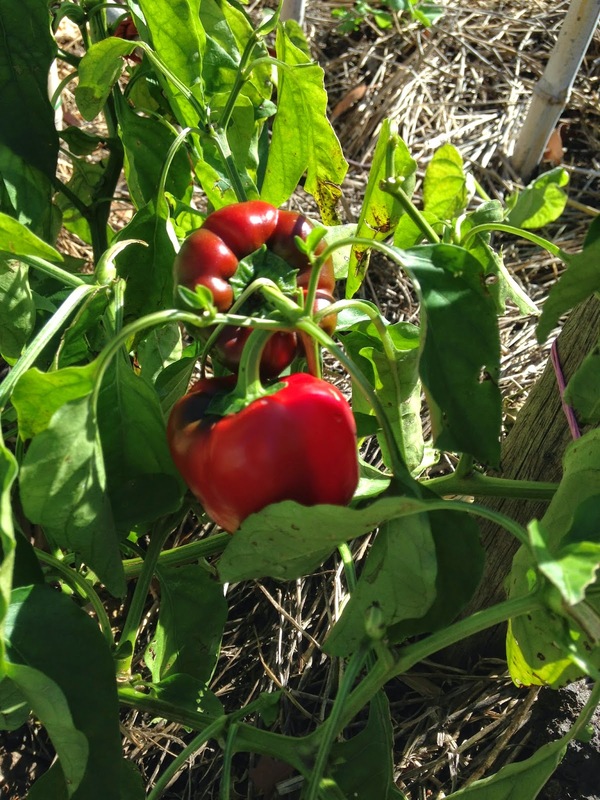 I picked the last two capsicums from the capsicum bush. I was a good season for capsicums. I think I got 15-20 from the bush. All were quite small, about the size of a post-it note, but all were crisp and full of flavour. I don't know what to do with the bush now. Do I pull it out and chuck it in the compost? Or do I leave it and it'll grow more capsicums next season? 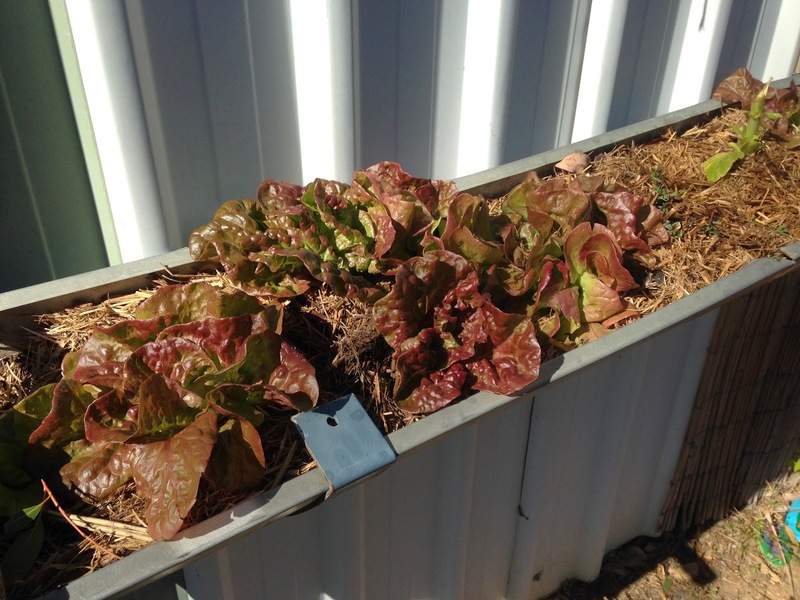 Lastly, I've kept a few of my surplus seedlings in pots to take to a market at Maleny and sell at the end of the month. I have cherry tomatoes, lemon grass, lettuce, bok choy and rosemary seedlings. The market is a Community Garage Sale at the Maleny Baptist Centre- Cnr Maleny-Landsborough and McCarthy Roads at Maleny on July 26th. Hopefully I'll sell all my seedlings and find a few bargains. 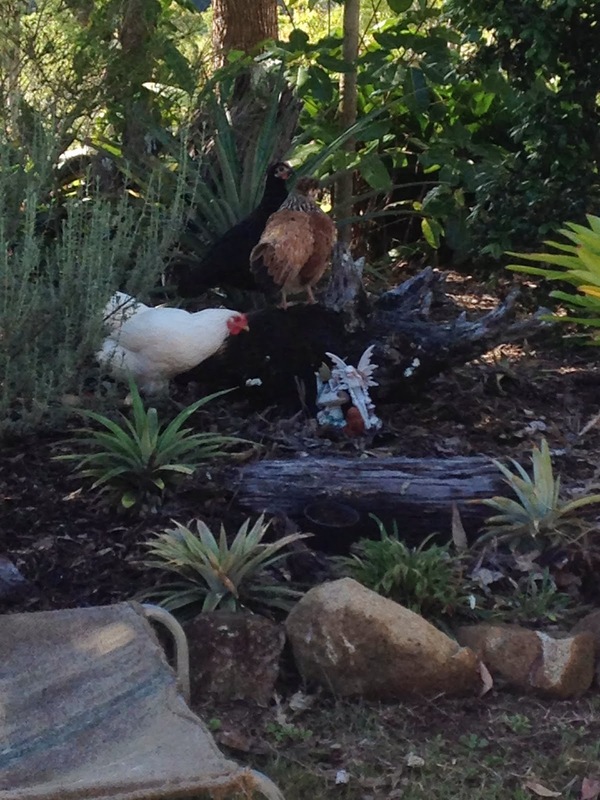 We now have four chickens, as we've taken in a refugee from a friend at work whose new dog ate all of her chooks, but one. So our flock welcomed Sooty last week, who is a grey silkie cross. I'm not sure how old she is, nor do I expect her to lay for some time- if at all- after the trauma she's been through (she was rescued from the jaws of the dog). Sooty is a very friendly chook- quiet, calm and able to be picked up for a cuddle. In other news, Chicken Dance has started to lay! 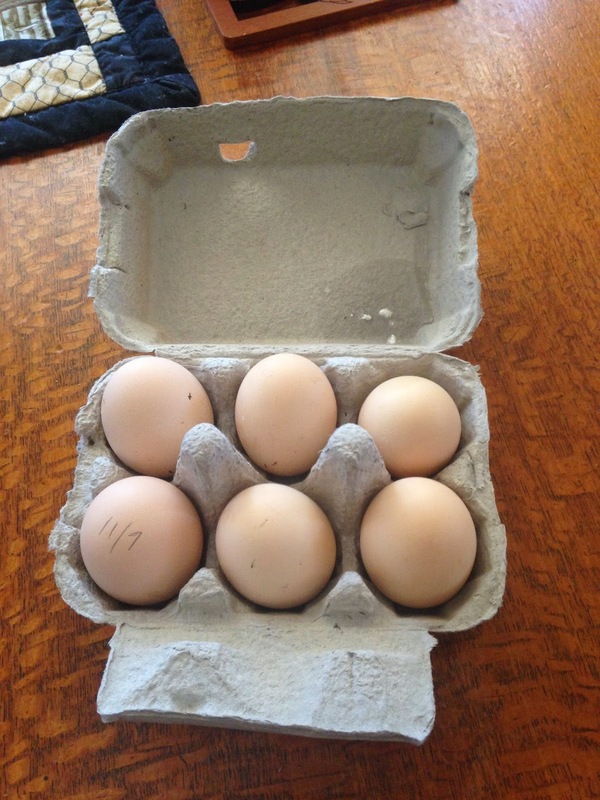 In the past fortnight, I've gotten six small eggs. 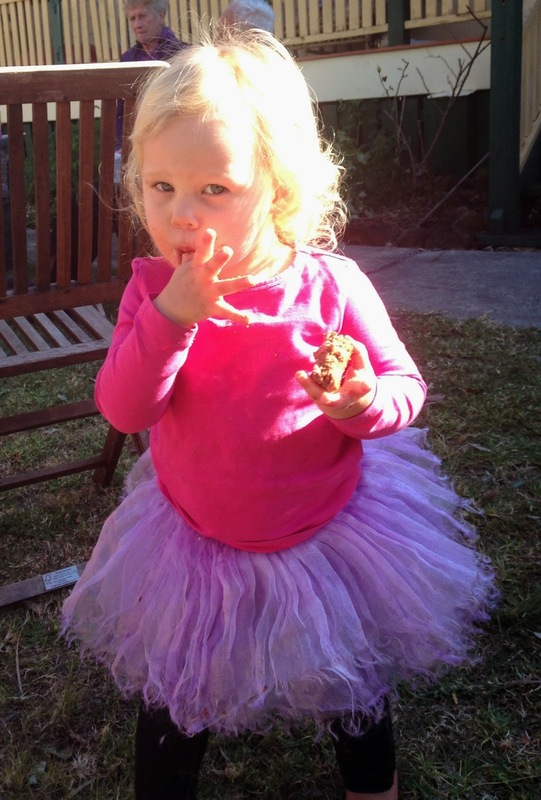 At first, I only suspected it was her, as she is the biggest chook. Then I caught her 'in the act' one afternoon. I'm now enjoying delicious home-produced eggs and I couldn't be happier. The Ladies have now settled into their routine. 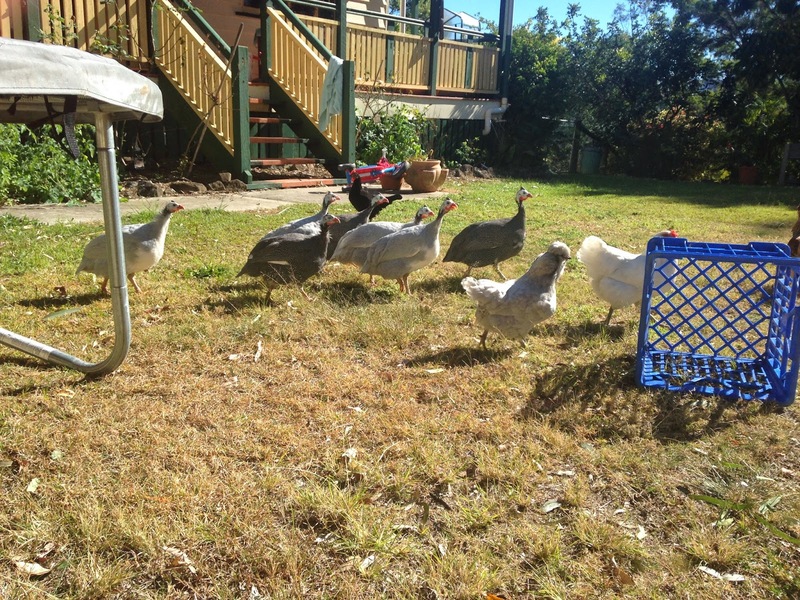 Every morning I let them out of their house, re-fill their water and put out some feed for them. They then scratch in the garden all day. 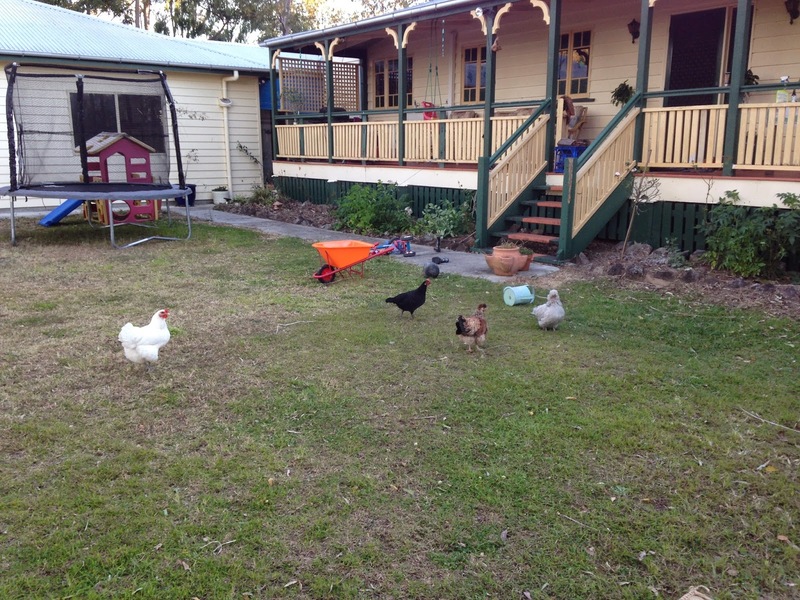 Of an evening, when I get home from work, the chooks are in their house, ready for bed. All I have to do is shut the door to make sure they are safe overnight. I still feed the Guinea Fowl every morning over by the goat paddock. Unfortunately, if I dont turn up with their feed before 8am, they come up to the house looking for it and making a racket. The perfect alarm, in case I wanted to sleep in on a Sunday. The chickens and the guineas get along well. 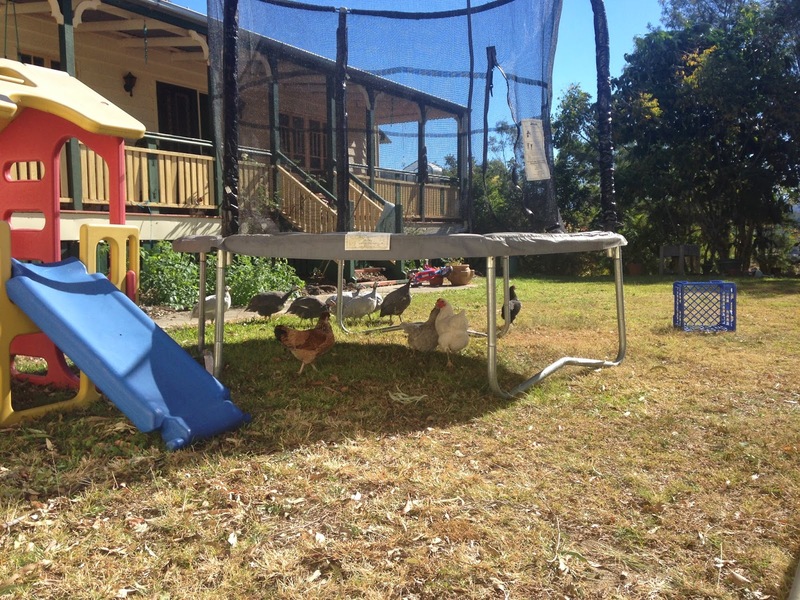 That is, the guineas basically ignore the chickens and the chickens ignore the guineas. 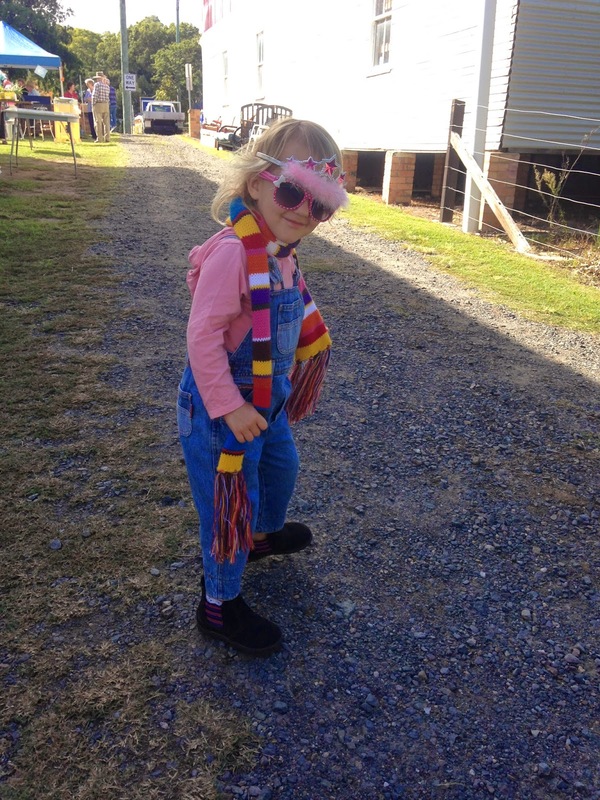 Lots of things have happened in the past fortnight- Gigi and I are living back at my Mum and Dads hobby farm. My dad has started a new job, so he and my mum will be staying at their holiday cottage closer to to the city during the week. They will come home on the weekends to help out with activities I can't do on my own- fencing, maintenance, tractor-work, etc. I've decided to I'm going to rent out my little cottage in town. I think renting at this stage will present lots of opportunities for me. I'll be able to save money much quicker for the improvements i want to make- extension; boundary fence; solar hot water; solar power; etc. I'll also be able to take the time to properly plan a permaculture design for the backyard. In the meantime, I'll be continuing to grow my own food at my parents house. I have lots of plans to extend the veggie gardens I already have growing there, from when I lived there last year, whilst saving to buy my cottage. I've also managed to talk my dad into giving me free reign to plant whatever I like at their house. I'm really looking forward to the learning curve ahead. We are lucky enough that my brother, sister-in-law and nieces live only an hour and a half away and therefore regularly come to visit. 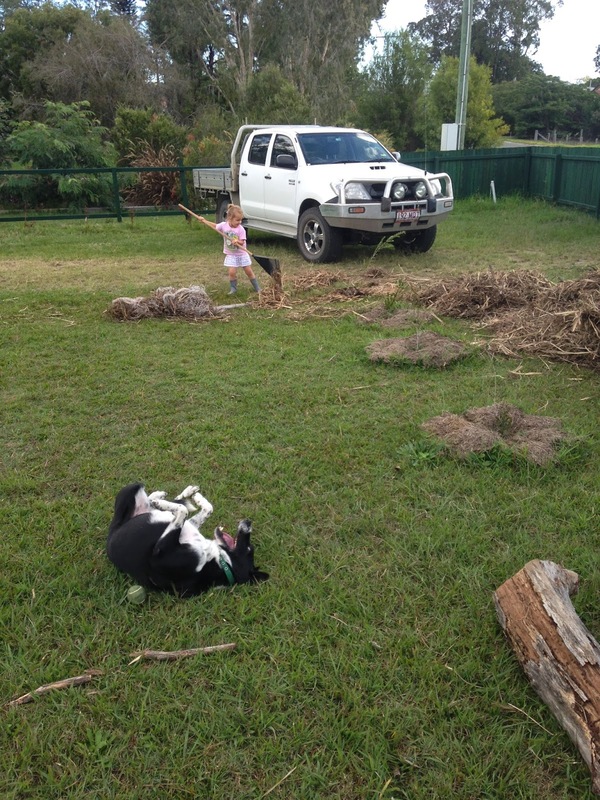 The girls ran around like crazy outside, playing with Pipi, the dog and trying to catch the chickens to cuddle. They played outside for most of the day, on the trampoline and on the various scooters and bikes we have. 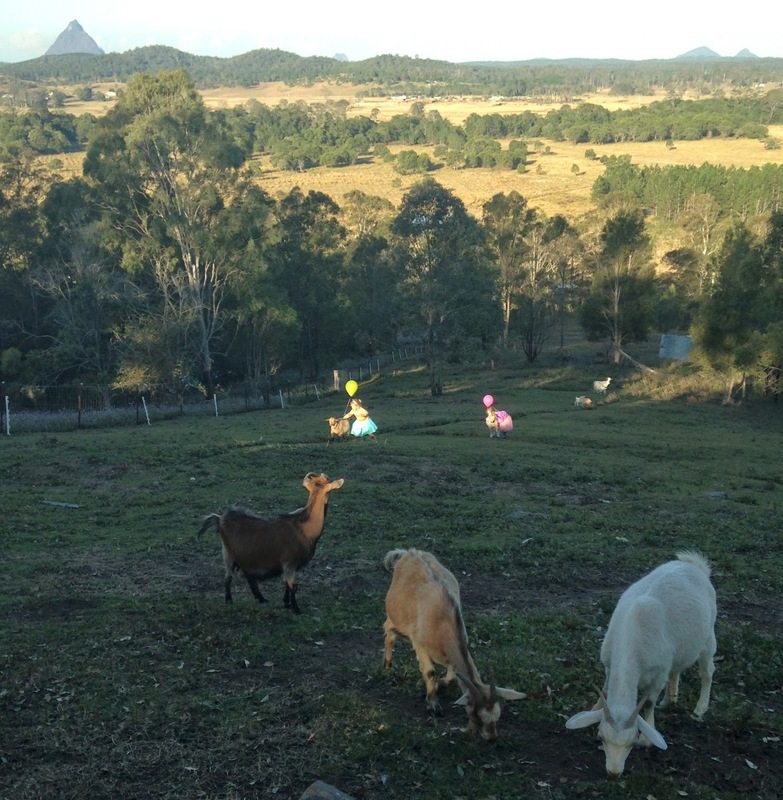 In the afternoon, I took the girls out to visit the goats. 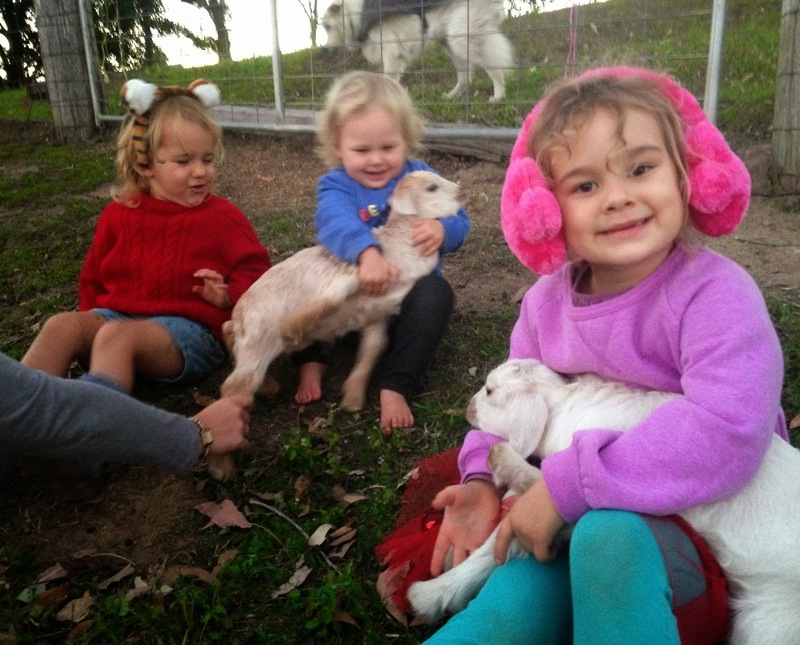 The baby goats were a huge hit. 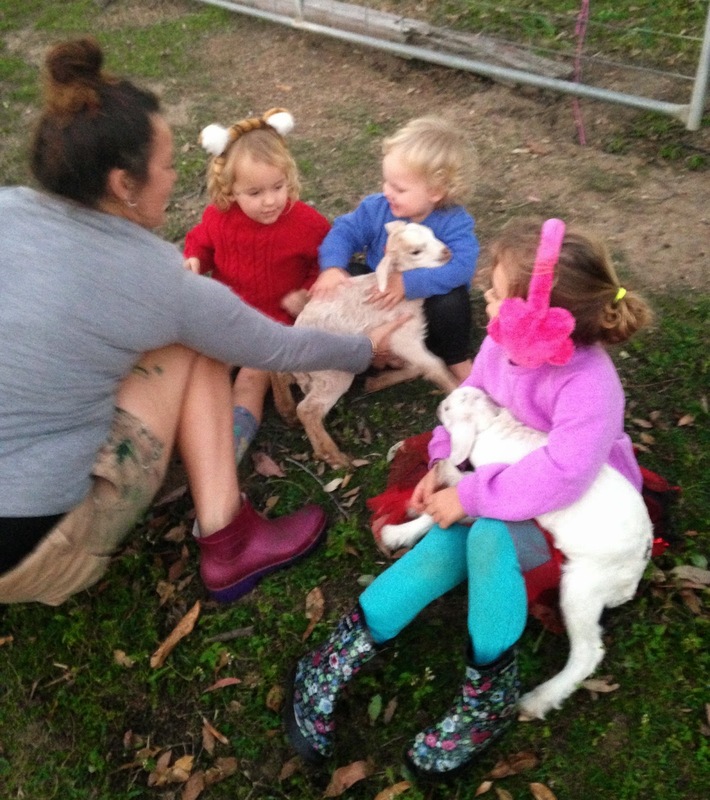 The girls loved chasing, catching and cuddling the babies. 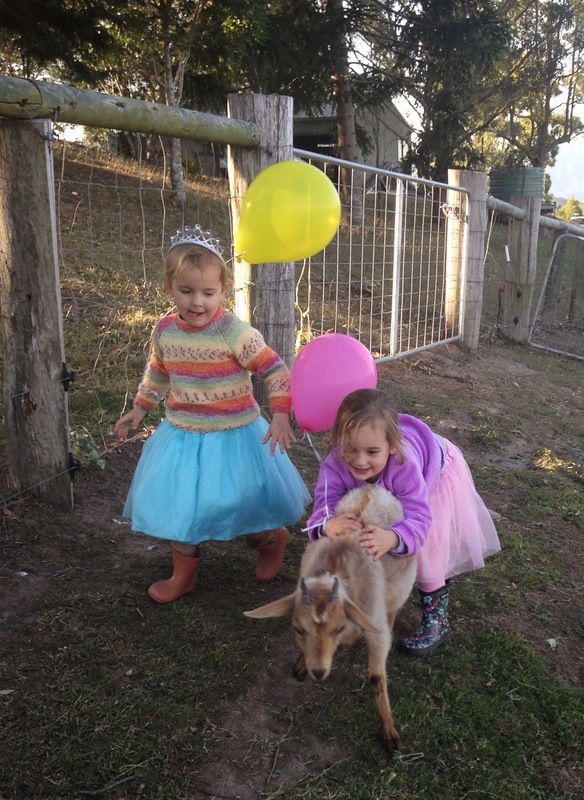 The goats on the other hand, weren't impressed. 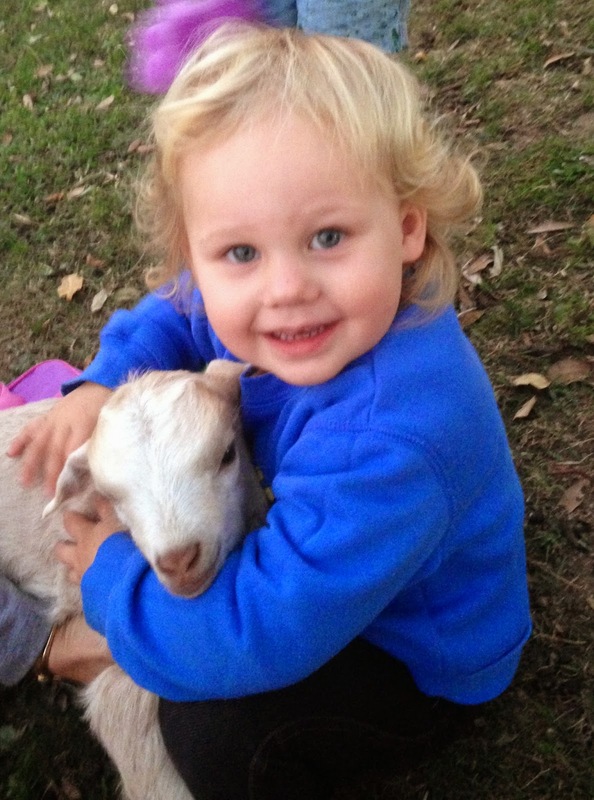 I caught a kid for Asha to hold and she cuddled it for about 20 minutes. 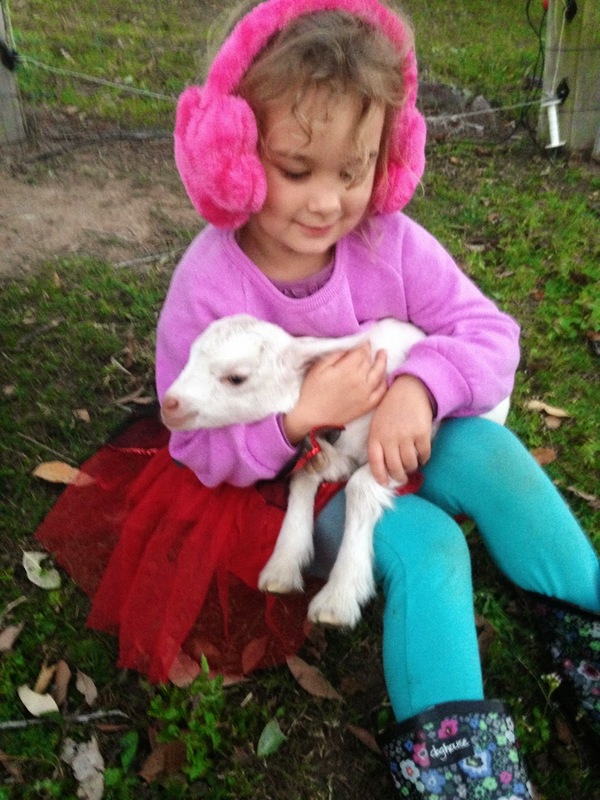 Lily managed to sneak up to and catch her own kid to cuddle. As mentioned in my previous post, winter has hit. We have had frosts every morning for the past week and the fire on every night, to keep us toasty. 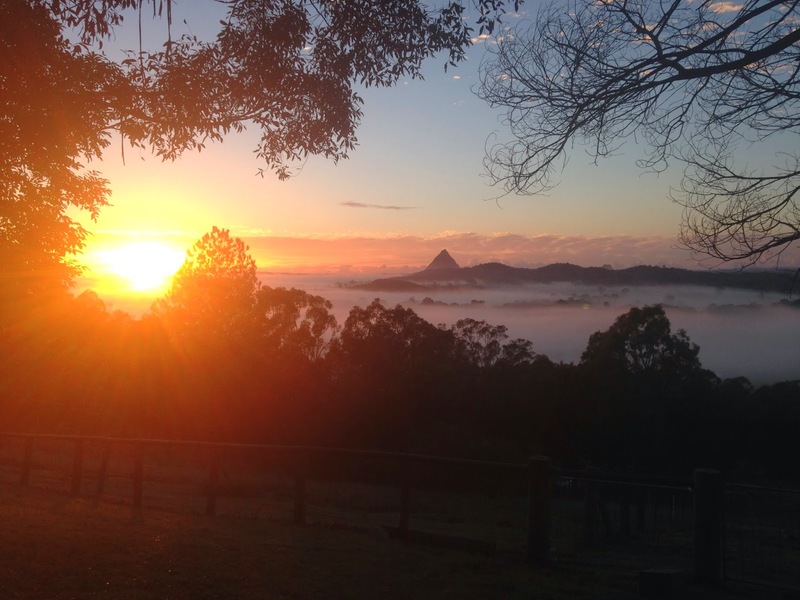 Gigi and I climbed Mt Beerburrum with a girlfriend of mine, early one morning. Due to the cloud cover and the 8am start, it wasnt too cold. 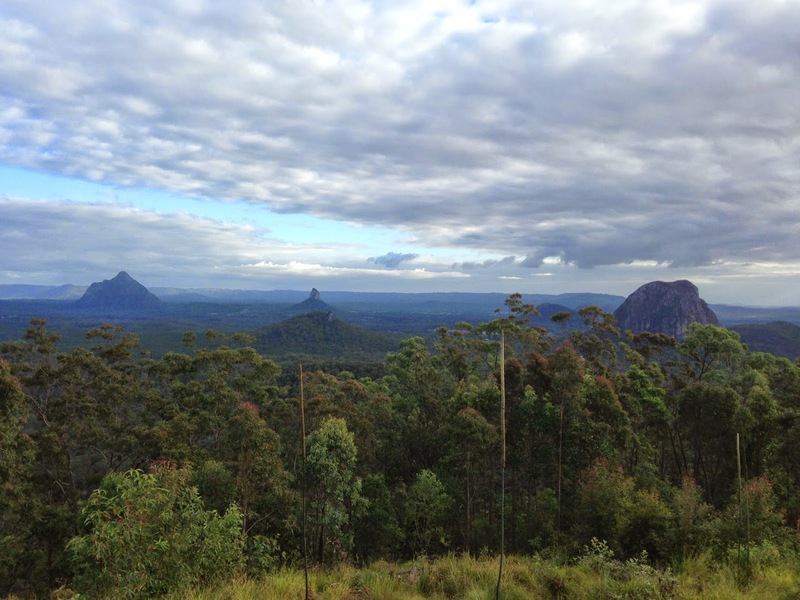 Although the track was very steep, it was a reasonably short climb, with a beautiful view from the top. Gigi walked most of the way, but had to be piggy-backed for the last section. 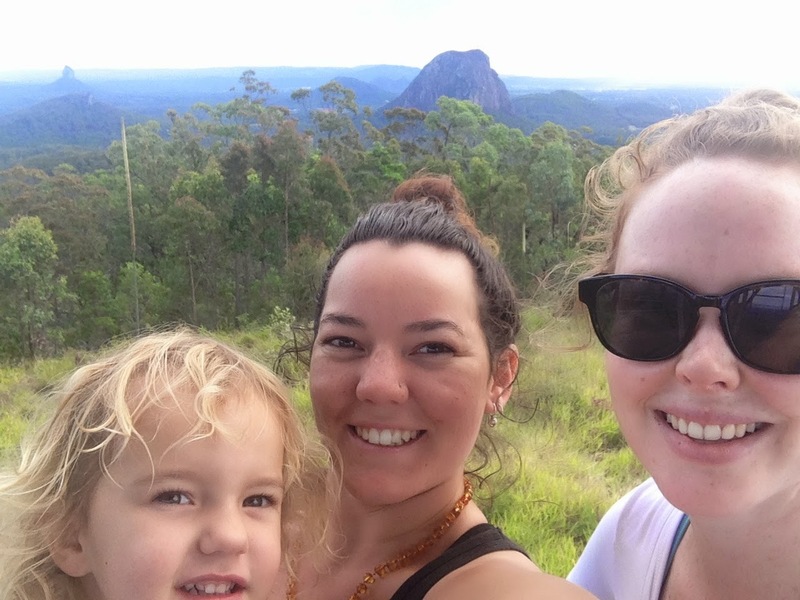 I thoroughly enjoyed this climb, it was a good workout, wasn't very busy (only two other cars) and much better for toddlers (as opposed to Mt Ngungun). I think we'll definitely be doing it again. Since our shift to 'simpler' and 'frugal' living, I have been buying most of our clothes and whatever household items from the OP Shop (thrift store). I'd always been a pretty keen op shopper, but now I try to source our needs second-hand first, before buying anything new. We have two in our Small Town, both very cheap and full of goodies. We heading to the church op shop last weekend to grab a few warm clothes, now that winter has finally hit with a vengeance in our part of the world. We managed to walk away with a new scarf for Gigi for $1, a hand-knitted cardigan for $5 (also for Gigi), and a woolen jumper for myself for $20. Even though I dislike plastic toys, and don't like to buy toys for no reason, I also bought these 'Dinosaur Feet' for Gigi. They were only $1 and I absolutely LOVED the pair I had as a kid. I remember spending hours walking around on them. Gigi also seems to love them. 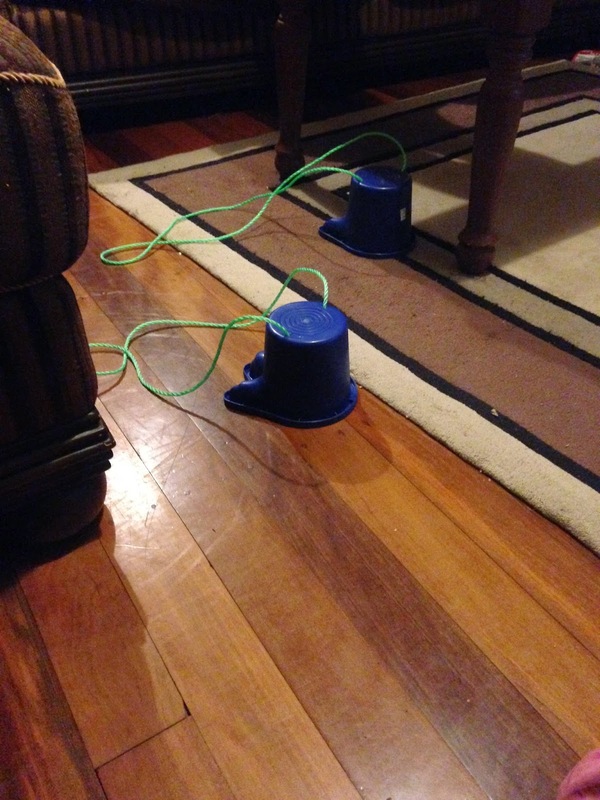 They are her most played with toy and she clomps around on them inside and outside. Her co-ordination on them wasn't good to start with, but seems to be getting better. 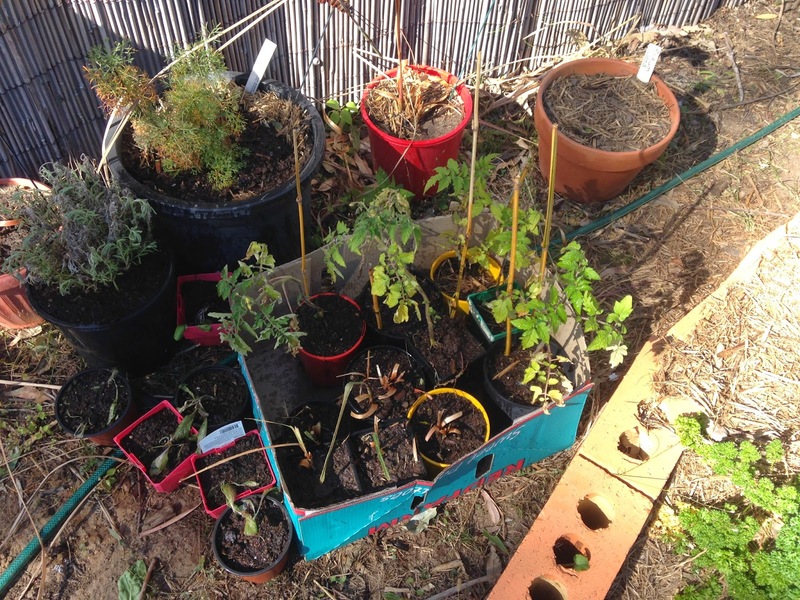 I've been planting some native trees in my front yard since I bought my cottage last year, with the idea that it would form a continuous garden for wildlife with my neighbours native garden. 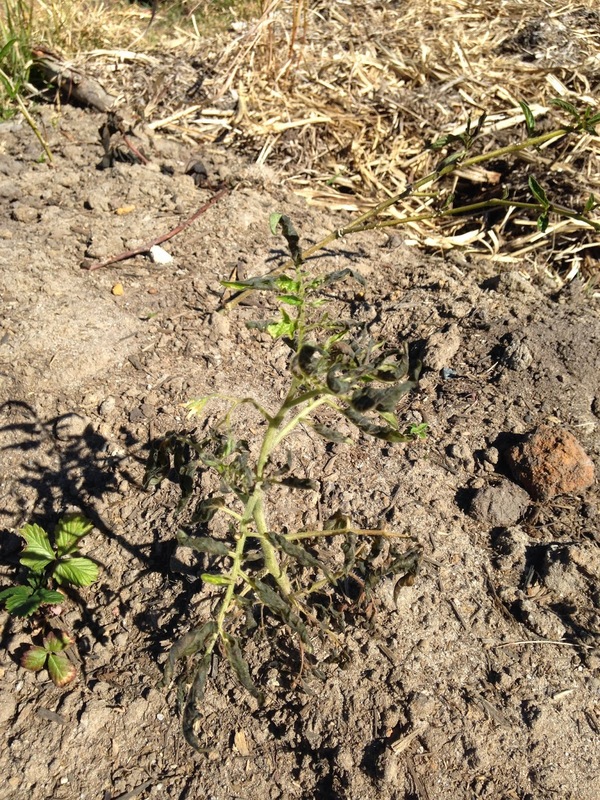 Regarding the location of trees, I've planted a row along the fenceline, and a second row approximately 3m inside property from the first row. 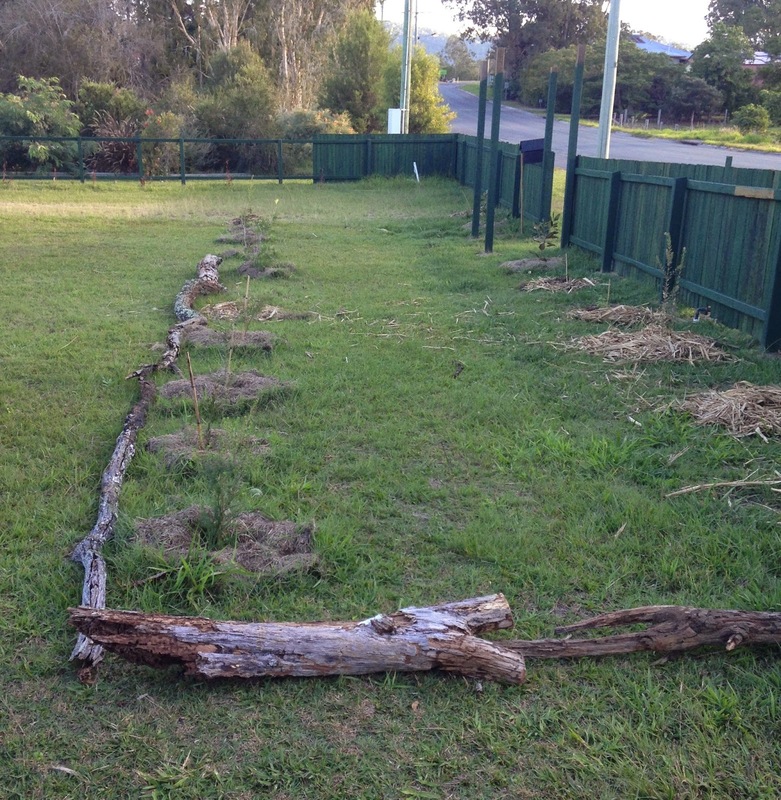 I've left a big gap as the sewer main runs parallel to my front fence, between these two rows of trees. As I live in an old subdivision, I feel uneasy planting trees over the top of the sewer main. I think it is best to leave it bare. 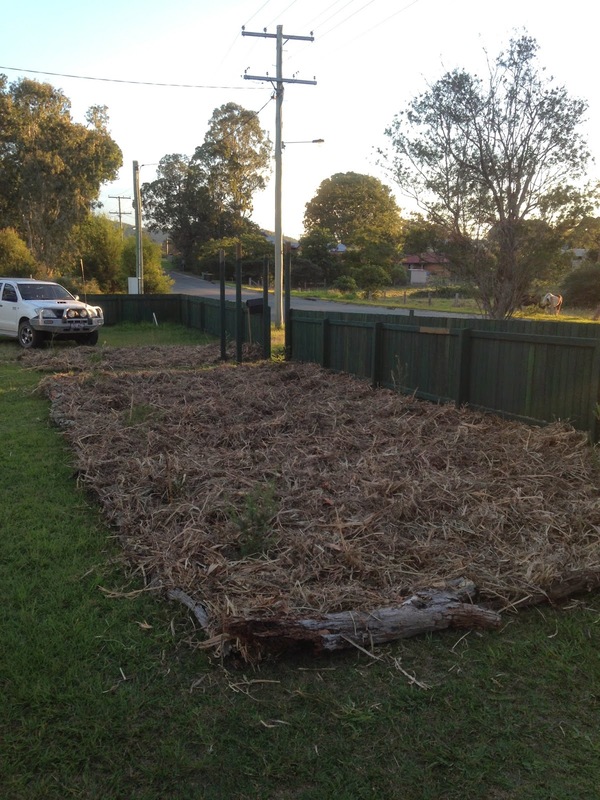 To save myself the hassle of mowing, I thought I'd mulch out the whole front area. 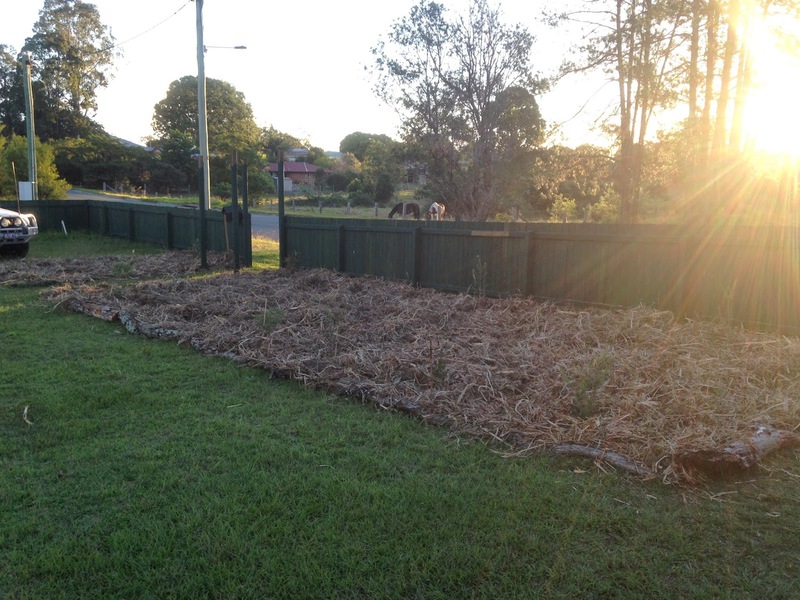 I don't like mulching areas unless I have garden edging, so I collected a pile of logs from the bush up the road from my house. Some I had to cut to size with a handsaw, which was hard work. I'm thinking I'll have to buy myself a small chainsaw at some point, if I'm going to keep doing these kind of projects around the house. 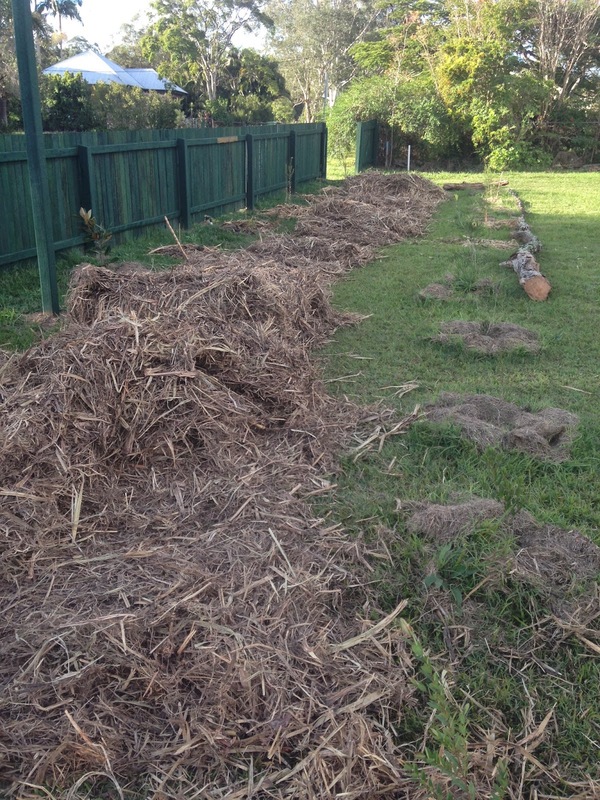 I bought a roll of sugar cane mulch from the produce in town and dropped it off at my house. It was so heavy, I couldnt physically push it. I used the ute to push it into position, cut of the ties holding it together, before using the ute to unravel it. 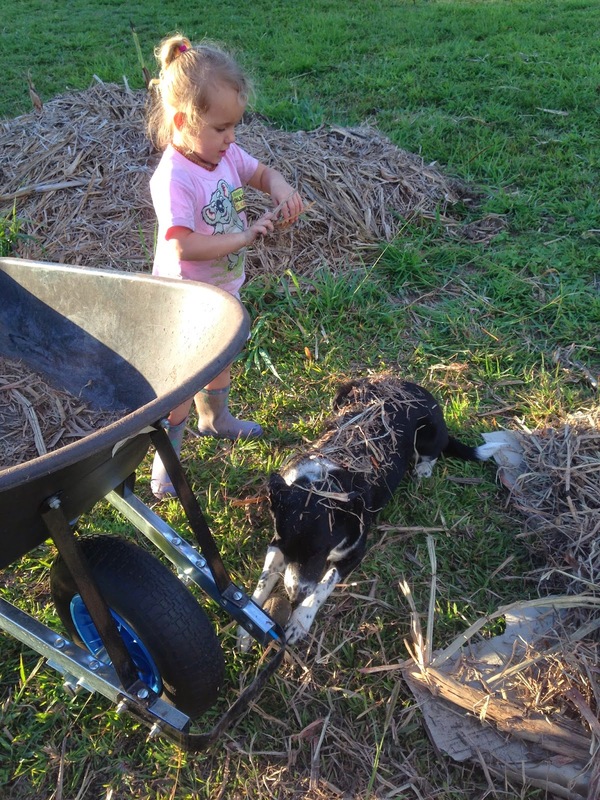 Gigi enjoyed raking the mulch around, before deciding that Pipi needed mulching. The whole exercise only took one afternoon and I'm pretty happy with the results. I'll need to collect more logs to continue the garden edging to the front corner, then up the side boundary. I'll also need another bale of mulch for the next section. But its slowly getting there.